Actually the house was right in the middle of the city, not in the woods, but that sounds nice–very Ingalls-Wilder-ish. A while back I posted a photo of a house with Alice Leeuwenhoek standing in front of it on Thanksgiving 1907. The address on the back was 126 Balch Street, which didn’t seem to conform to current addresses. I asked a lot of questions about it. Uncle Don explained that were some buildings behind the houses on the street. It looks like the numbers are in the same location as today. There are a couple of outbuildings behind 126, so either the house was torn down and rebuilt, or the one of the outbuildings was used. Here is the house that is on the street, numbered 126, today. Let’s look at the pic and think back to 1907. In the photo you can see an outbuilding behind the house, so it’s unlikely that it’s off the street, behind another building. But if it was 126, wouldn’t the outbuilding be poking out on the other side? And wouldn’t the house be larger? As to the second question, maybe not. The house shows one room and behind it another room, so maybe from the photo we can’t see the depth of the house. As to the first question, what if the photo is reversed? I don’t know too much about the process of taking photos or developing them in those days, and maybe the photo is reversed. OR. What if this is an outbuilding and that building off to the left is a house on the street from another angle? The more answers I find, the more questions I have. I think my husband is right: I ask way too many questions. 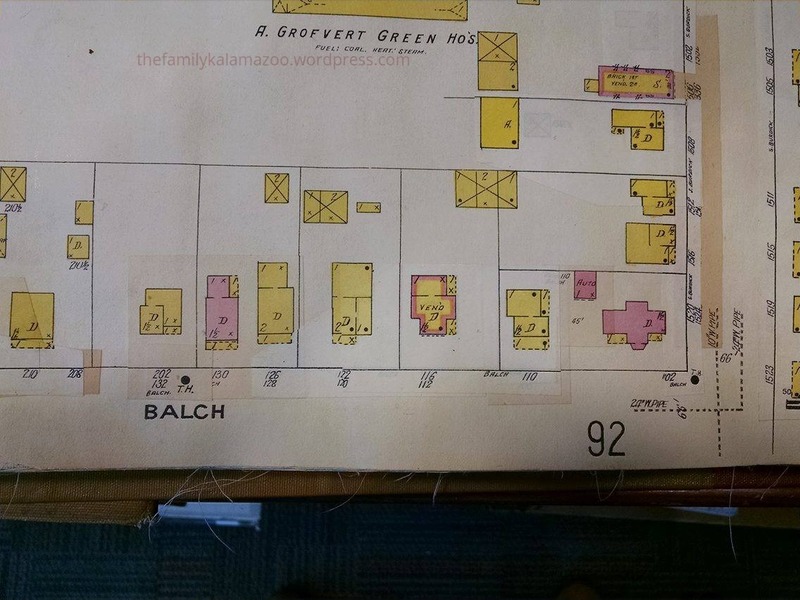 This map is invaluable to me because so many of my relatives lived in this neighborhood. I am going to use it to plug in the addresses on the census reports–yippee!!! My guess would be that the picture is of building #2 in the back of the lot with an outhouse showing on the left side of the picture. There looks to be a buggy parked on the back right… it could belong to the property behind (A. Grofvert Green Hos…)? Is there a significance to the numbers 1&2 written on all the buildings? I think the way they wrote the addresses with 126 over 128 indicated the back building is #126. Nancy, do you think that an outhouse wouldn’t show up on the insurance map? I was thinking about what you said about front and back addresses, so I went onto Google maps. I’ll attach the current 126 in the body of the post. It’s on the street, so chances are 126 was on the street in those days, too. But there is no 126 on the 1910 census, which is strange unless they just weren’t home at that time??? Because outhouses were moveable (when full!) im sure they wouldnt have placed them on the map. (Current land surveyors only indicate permanent structures – no foundation it’s not located, or will be marked as temporary structure). The building has a verandah, as per the map. It could be reversed, as the rear building looks substantial. Your husband is not right. If our ancestors hadn’t asked questions we’d still be living in caves. Keep asking. Hahaha, I love it! He does usually think he is right, but I know the truth ;). I’m sure I get annoying with all my questions, but that’s why I like family history! So you don’t think the rear building is an outhouse? I just posted a pic of the house that is at 126 today, and it is on the street, by the way. One can never ask TOO many questions! (I’ve been accused many times of the same, so I should know.) And what a great map. Have you driven by that location recently? Are those trees still there (obviously much bigger)? Might that help you determine if the photo was developed backwards? Amy, I just posted a pic from Google maps of the house that is at 126 today. Does that help? 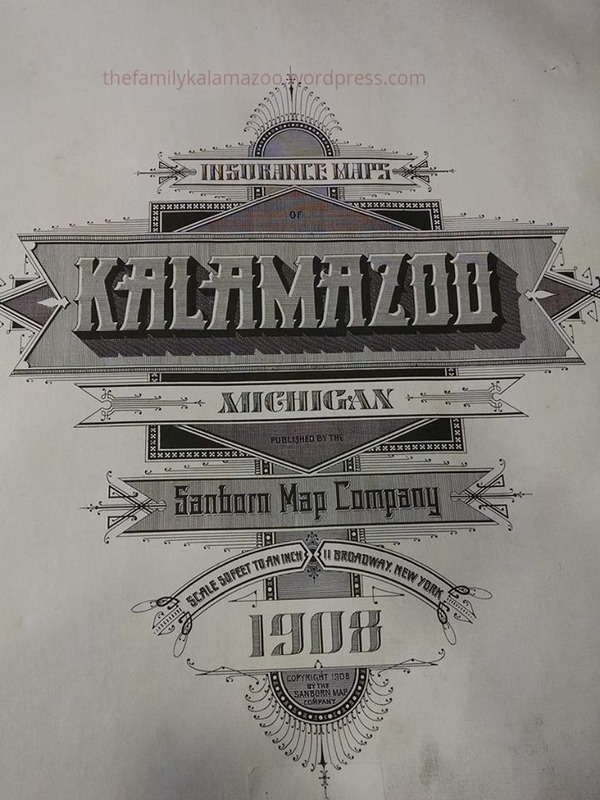 hah The other problem is that Kalamazoo lost a lot of elm trees mid-20th century, so that changed the tree landscape considerably. I am confused. That’s not the same house, right? It sure doesn’t look like it! Plus it looks so far back in the old photo, but this house is right up near the street. I am confused, too! 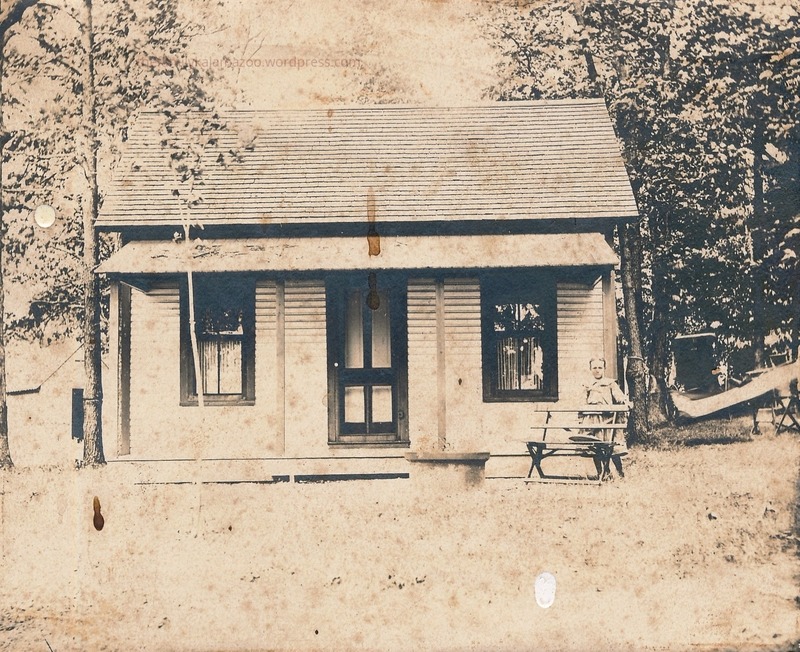 My guess is that they tore down that little old house and the structure behind it in the 1910s or so, so I don’t think we can tell too much from that photo. But if the trees are any indication, it looks like your original photo is a mirror image and developed backwards. I agree with Amy, no such thing as too many questions. It’s the question asker that finds the answers. Thank you for your support hah! I am never at a loss for questions, that is for sure!!! I know that I’m going off on a tangent, but your discussion about reversed photos reminds me of how we often used to put slides into the slide projector backwards and end up seeing reversed pictures. I agree with Nancy. 126 is in the far back of the yard. 128 is a two-story house as shown by the 1 and 2 on the plan. Also, some Sanborns do show outbuildings—some bottle collectors use them to find outhouse locations, which were once the house “dump.” I don’t see outhouses on this one. Your “too many questions” is what make you a good researcher. Great info about the bottle collectors! Thanks for your insights! The building to the right of house 122 is perhaps an outhouse, if not a shed. Never ever not ask too many questions – lol!! It looks to me that your 126 from the 1907 photo is the back structure of the lot – can’t see it from Google Earth though – drat! Can you sneak back there and confirm? 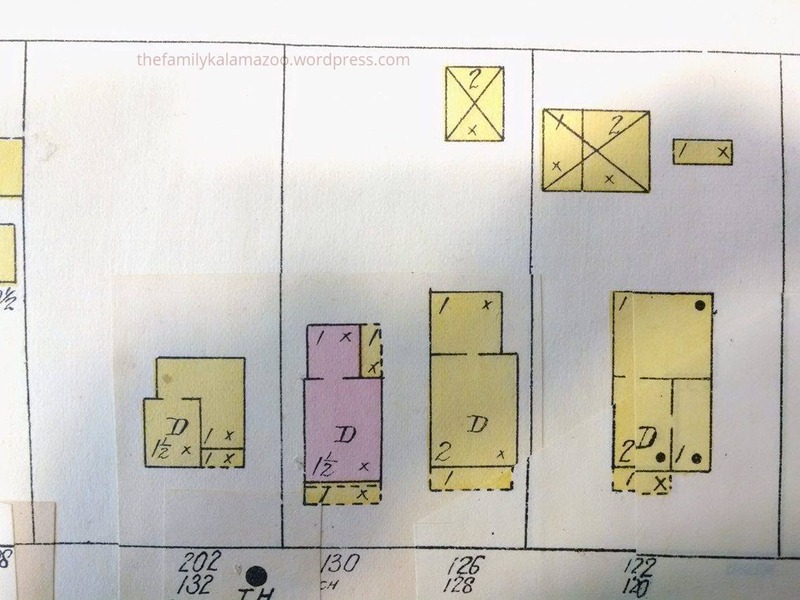 Who lived in the ‘front’ house? Uh oh I’m asking more questions! !